What is the EU NIS Directive… and how can a Security Operating Platform help? The NIS Directive calls for technical and organisational security measures with regard to the state of the art and appropriate measures to prevent and minimise the impact of incidents. Legacy security systems made up of cobbled-together point products have proven inadequate to provide the level of visibility and control required to prevent the rising volume and sophistication of cyberattacks. 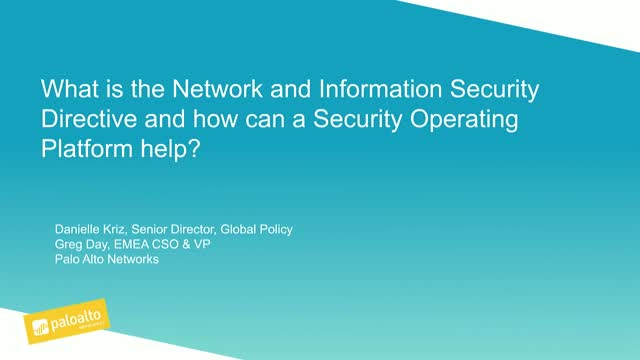 In this webinar Danielle Kriz, Senior Director Global Policy, and Greg Day, VP & CSO EMEA, discuss how the Palo Alto Networks® Security Operating Platform can help organisations along their road to compliance. The Security Operating Platform prevents successful cyberattacks through data-driven automation and takes advantage of precise analytics to streamline routine tasks so that security teams can focus on the threats that really matter. Visibility into all traffic, classified by application, user and content, provides the context to enforce dynamic security policy to prevent known and unknown threats throughout the attack lifecycle. Title: What is the EU NIS Directive… and how can a Security Operating Platform help?